As we saw the end of Satrangi Sasural, we can all breathe easy as Zee TV Africa brings you a dynamic new series at 17:30 to 18:00 from Monday to Saturday, VISHKANYA. A fairytale romance set in Kolkata, two beautiful young lovers, sizzling chemistry and a match made in heaven are haunted by a cruel curse that dogs the girl and makes the tale culminating. Deboshree had an oddly secretive upbringing in a lower middle class Bengali home that’s completely out of place in a wealthy Marwari neighbourhood. The child grew up in a bubble, as she was never allowed to interact with neighbours, play with kids, go to school and was strictly home tutored and trained by her ultra-protective and enigmatic, single-mother, Maasi. To all her queries, she was simply told that she was born unwell and had to gain immunity before she could interact normally with the outside world. Her mother was obsessed by her turning out ‘perfect’ that she even ignored the needs of her own niece of a similar age, Tupur who grew up jealous of her cousin Debo. Things changed when their wealthy Marwari neighbours returned from many years abroad and with the entry of their son Malay on the scene. Tupur, Debo’s cousin vied for the attention of Kolkata’s new, most-eligible bachelor, Malay but he himself was besotted at the first sight of the ravishing Debo. Much to the growing fury of his controlling mother, who detested and had been suspicious of these neighbours forever. There’s a lot going on under the surface of what appears to be simply two mismatched families with star-crossed young lovers residing in them. When a dark secret from the past combines with the truth about Debo’s lineage and the truth about her secretive upbringing, it shatters and shakes up a lot between the two families and even the lovers themselves. As we discover that there are secret scores to settle between the two families between Debo’s strong Maasi and Malay’s equally strong mother. We also discover that Debo is an unfortunate pawn an innocent vehicle for revenge and that she comes from a lineage of poisonous women. Debo is an unknowing, latter-day Vishkanya (poisonous girl) who’s cursed with widowhood as the man she consummates her relationship with, cannot survive. Where this impossible and complex fairytale romance will lead the two lovers and whether they’ll ever be able to extricate themselves from this web of darkness is what Vishkanya is all about. 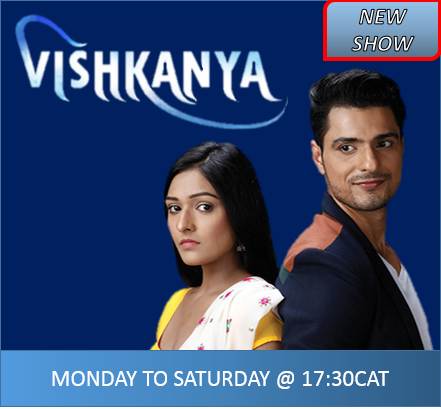 “Vishkanya is fresh new series with an amazing story line and drama that will keep our viewers glued to their screens, this show will definitely be a hit”, says Harish Goyal Zee TV Africa CEO.